Relative stability has been a theme of the past 18 months of log trading. This has been very welcome in contrast to the damaging volatility of prior periods. Forest owners, harvesting contractors and related service providers have enjoyed the resultant continuity of work and more reliable financial outcomes. This is not to say the sector has been all plain sailing. The steady increase in log export prices has been challenging for many domestic log processors as has the strong rise in the NZ$/AU$ cross rate and lack-lustre Australian economy in general and housing and wood products markets in particular. The stability, however, bodes well for the harvesting profile over the next 10-15 years. With harvest volumes forecast to increase from the current annualised 26m m³ to 35m m³, there will be a significant increase in demand for harvesting and cartage contractors, port services and, hopefully, domestic processing. This will require a lot more people, training, trucks, trains, log storage areas, ship berths and other plant and machinery related to moving and processing the 40% increase in volume. At least these periods of relative market stability increase confidence in the sector and encourage participation and business investment. A potential major fiscal cost to government if it has to account for carbon emissions from harvesting as it currently does as part of the Kyoto protocol; new forests are not being established to offset these emissions. A risky scenario for any world-scale investment in wood processing – who would want to invest 100s of million dollars if log supply cannot be assured in the long-term? So whist we might feel in a relatively benign situation with respect to the current forestry economic situation, we should be concerned about a much less certain future. These are issues PF Olsen, the NZ Institute of Forestry and others passionate about forestry are currently posing to the government. On a more positive note, Global Construction Economics and the Oxford Express are forecasting meteoric growth in global construction markets, concentrated in three countries – China, India and the USA. This new report forecasts the value of construction output will grow by more than 70% to US$15 trillion by 2025. China and India's growth will be driven by demand for infrastructure (e.g. transport and utilities), commercial premises and 270 million new residential dwellings. Growth in the USA will be more modest but off a large base and driven by house construction and infrastructure re-investment after years of deferral and spurned on by a strong economic up-cycle and new wealth from exploitation of vast unconventional natural gas reserves. The unusually stable log market is welcomed by forest owners. However, long-term challenges face the forestry sector. The traditional slow-down in wood products demand through the China "hot season" has been very minor this year despite a heat wave posting record high temperatures. This is attributed to very robust construction activity. China demand for logs and lumber has surged back in the second quarter of 2013. According to the Wood Resource Quarterly, after a decline in importation of logs and lumber in China in 2012 and early 2013, increased house building activity has seen imports climb strongly in the last quarter. In the first half of 2013, year-on-year investments are reported up 13% in residential housing and up 23% in commercial buildings. Growth in import of softwood fibre has been strongest in lumber. Although the largest growth has been from Russia and Canada, New Zealand lumber exports for the first five months of 2013 are up 27% on the same period last year. Log demand has also been strong and has enabled NZ to surpass Russia as the largest softwood log supplier to China. 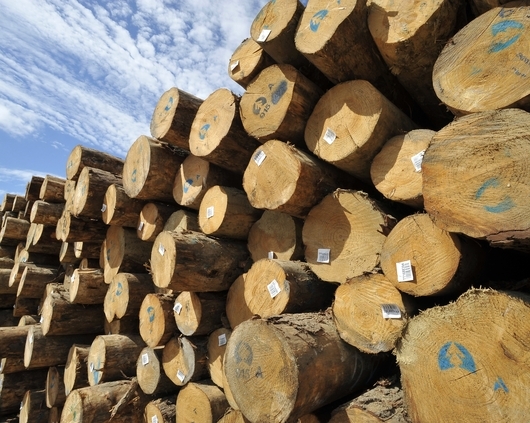 Wood Resources Quarterly reports the total value of imported softwood logs and lumber into China at US$ 2.2 billion in the second quarter of 2013, an increase of nearly US$600m from the prior quarter. So far, the robust construction market has been resistant to the general economic slow-down in China and the reduction in imports of mineral commodities that has hit Australian exporters. However, imbalances in the Chinese economy and rapidly increasing leverage are looming threats for demand for forest products. In late June China hit a serious, but short-lived liquidity crisis which stemmed from soaring credit. Interbank rates where reported to have spiked as high as 20% before retreating to less than 6% once the People's Bank of China confirmed it was pumping liquidity into the system. This roller-coaster ride was triggered by the powerful surge in leverage in the Chinese economy where the debt/GDP ratio has climbed to almost 185%. Whilst the China banking sector still looks solidly capitalised the quality of its loan portfolios is expected to deteriorate as the economy slows further and borrowing conditions are tightened up. Coupled with an economy still over-reliant on investment spending (45% of China's GDP still comes from investment - in contrast, corresponding percentages peaked at 36% for Japan and 38% for South Korea) and lack-lustre global demand for its goods, the growth rate in China is widely expected to decline further. Some say growth will drop to rates of 6-7%, barely sufficient to keep pace with the rapid urbanisation process and its high demand for job creation. A careful and finely-tuned balancing act by the authorities stewarding this highly controlled economy is required to sustain the "Chinese economic miracle". The Indian market is struggling with a weak currency and deteriorating economic indicators. Well-positioned exporters are maintaining a presence, and as usual, returns for lower grade logs in this market can be competitive. Korean log demand is steady at an annualised rate of about 2.5m JAS m³, (15-20% of total log exports from New Zealand). Subdued domestic growth and resurgent Japanese exports on the back of a lower Yen are constraining the Korean economy. Strong housing starts and the Fukushima rebuild continue to underpin strong demand for forest products from Japan, but North American suppliers continue to be the main beneficiaries. Ocean freight rates and the NZ$/US$ cross rate have remained relatively stable for the past few months, contributing to the lack of volatility in at-wharf-gate export log prices. The BNZ's residential housing market survey reported a strong net 48% of real estate agents responding that they perceive house prices continuing to rise. Auckland leads the price rise perception at 82% with Hawkes Bay/Gisborne at the other end of the spectrum at just 5%. With net migration figures rising firmly and about 50% of new migrants going to Auckland, prices are likely to continue to keep rising. Average Auckland dwelling prices in June were 20% higher than a year ago after month-on-month rises of 4.4% (May to June) and 2.0% (April to May). Christchurch is the other property hot-spot with the average dwelling sale price for June 10.4% ahead of a year earlier, and 28% ahead of the December 2008 level. Canterbury is experiencing strong economic activity based on population inflows and the reconstruction programme. Rents and house prices are also rising on the back of a much depleted housing stock after the February 2011 earthquake. Apart from the obvious earthquake re-build economic stimulus in Christchurch, what are the other main drivers of the current housing market boom? Strong net migration flows. Based on the last three months, the BNZ reports a net annualised migration gain at of 23,000, and rising. This is mainly due to declining net outflows to Australia due to its poorer economic prospects. Historically low mortgage interest rates with minimum market impact expected from the government's credit tightening initiative with banks. Good economic outlook, including the labour market, and strong household formations. Pent up demand from deferred housing purchase during 2008-2011 when there was a fear of house prices collapsing in the fall out from the global financial crisis. Shortage of builders and trades people, especially in light of the large construction programme in Christchurch. If this housing cycle repeats prior patterns, the strong price increases currently centered on Christchurch and Auckland will spread out to the rest of New Zealand as the cycle matures. This will be assisted by the boom in the diary sector which is boosting rural incomes. The strong performance of the US housing market (which benefits some NZ producers, mainly those focusing on clearwood products) has seen some slow up in demand and softer prices. This is generally seen as a correction after a strong run-up rather than any reversal of the well-established up-trend. As mentioned above, exports of lumber to China are up considerably, but prices are subdued and product mix preferences are in the lower grades. Export pruned log sales continue to be weak in contrast to steady demand for domestic pruned and strong demand for high quality logs. Demand for structural logs is strong in most regions with prices firm. Unpruned export and domestic pulp log demand and prices are steady.